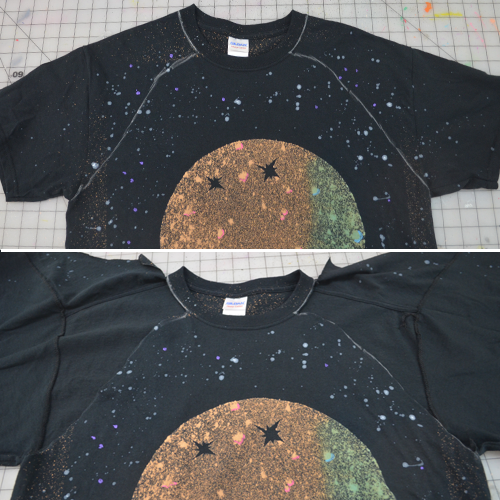 When I was first asked to create a galaxy shirt, I wanted to create something different from what I had seen before. 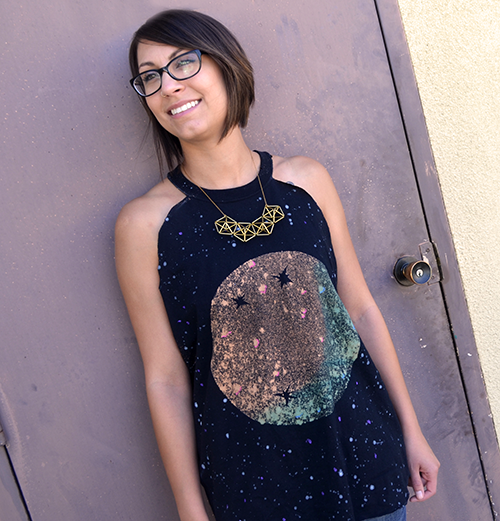 My original thought was to create a galaxy inside of the shape of Saturn, but once I bleached the shirt, I realized it looked more like the moon and decided to just work around it. 1) First you’ll want to cut a sheet of freezer paper large enough to cover your shirt then draw & cut out a circle in the middle of the sheet with the craft knife. 2) On another sheet of freezer paper, draw and cut out three stars. 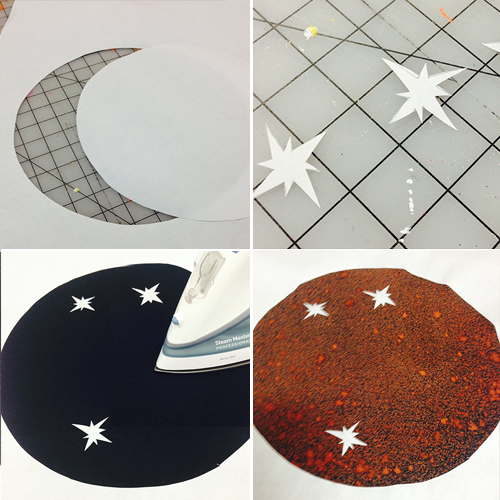 3) Place the circle piece aside and iron on the large sheet of freezer paper and three stars onto your shirt. Now use an iron on cotton setting and iron-onto your shirt. 4) Next spray a bleach/water mixture over the open circle on the shirt and let it sit until you have the desired look you want. It will remain more of a red/brown color. Remove the freezer paper then rinse the shirt out and let dry. 5) Add water to the Turquoise dye bottle and shake. Spray only the bottom right section of the shirt to create the look of shadow. Let it set for 6-8 hours and rinse and dry again. 6) I used the circle freezer paper to cover up the moon shape for the next step. 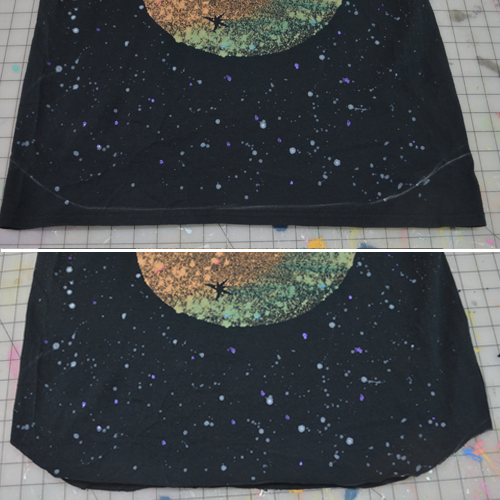 I removed the top to the Tulip Fabric Spray paint and splattered the paint all the around the shirt to create the look of stars. 7) Once that was dry I went back with a brush and used Purple Tulip Soft Fabric Paint and added dots to add more color to the starry night. 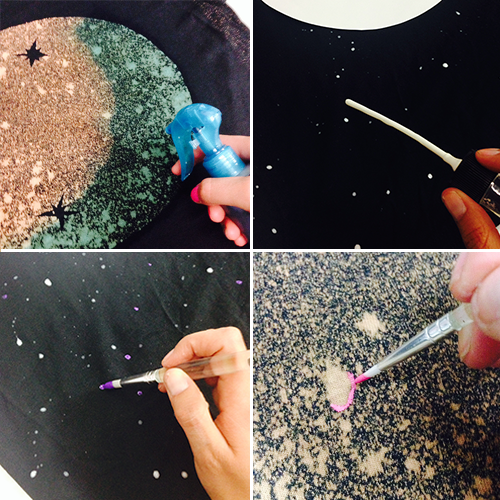 8) I used the last two Tulip Soft Fabric Paint colors, Pink & Neon Blue and used them to accent some of the craters on the the moon. 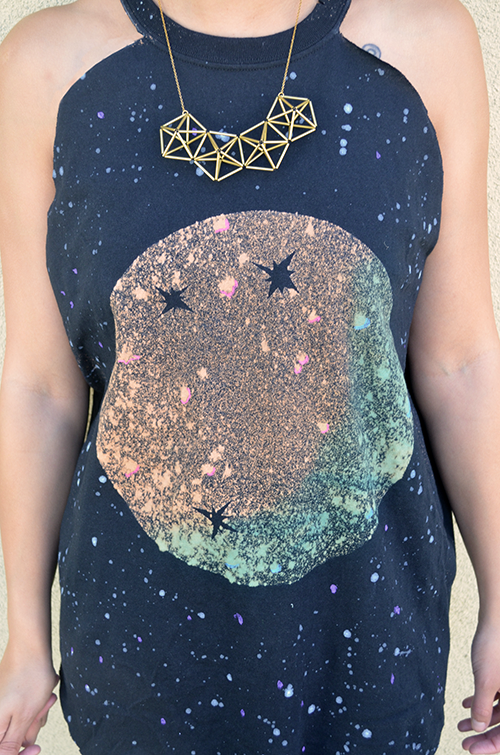 9) Use a piece of chalk and draw guidelines for cutting to make a halter-style tank. 10) Use your fabric scissors to cut along those lines. Don't worry, the chalk comes right off! 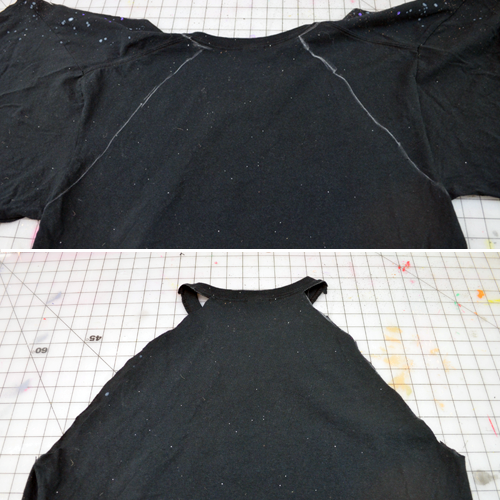 11) Flip your shirt over and repeat the chalk-drawn lines to resemble the front. 12) Cut with fabric scissors. 13) Draw a chalk line on the bottom and scallop the edges off. 14) Now cut! Yay! You're done! I paired it with a cool himmeli necklace that my friend Alexa bought for me for my birthday. 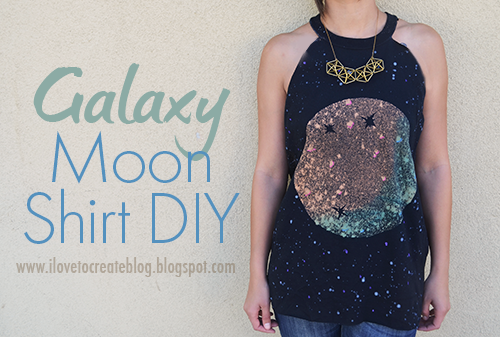 I thought it was the perfect touch to add to my galaxy shirt! 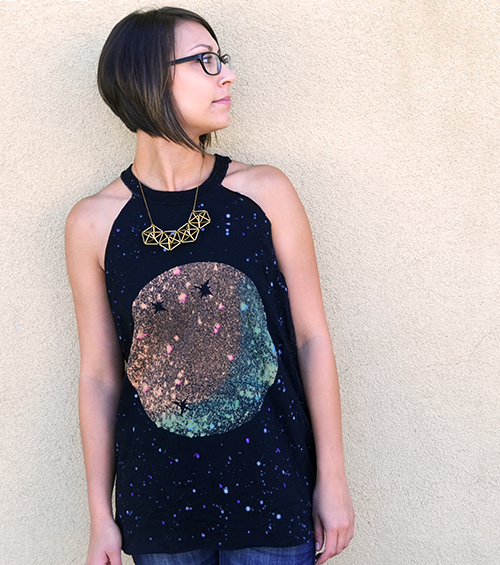 I plan to pair this shirt with a pair of black legging and some turquoise flats! I can't wait to wear it for a night out with my friends. Very creative! Thank for this awesome idea.